I recently received an email from a crafter in Belgium. She had made the tea Light Village I designed back in 2013. 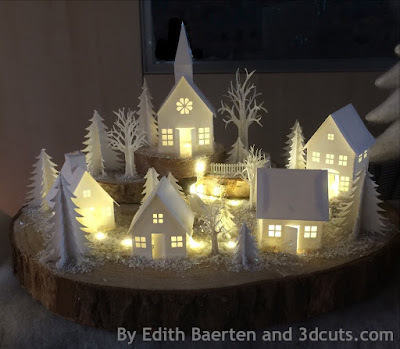 She shared a photo of her village all set-up for this holiday season. I thought it beautifully displayed. I love that she used string LED lights instead of the single tea lights. That is so much easier to turn on and off! She has all the buildings up through 2014 but I don't see my two new ones there. This year I added two more houses, a Salt box and a gambrel colonial. I call them my New England Classics. I also added a Rose Arbor and another style pine tree for accessories. The are all available at the 3dcuts.com website here along with a step-by-step tutorial here. Here is my photo of the complete village. Hi Marji! It's so nice to see you active in this blog and to be able to connect with you. My name is Merce and I live in Barcelona, Spain. 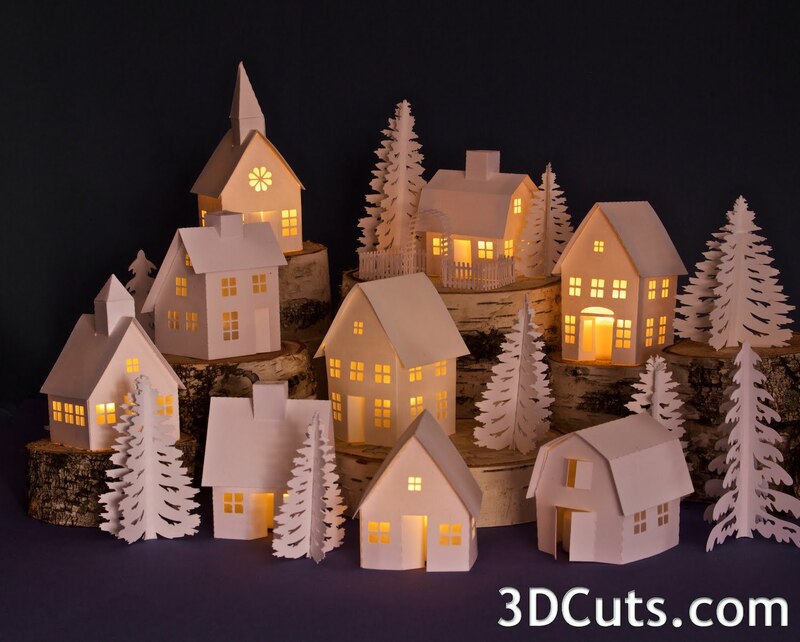 I'm currently making the tea light village also. Dedicating some hours the last 3 days, I've managed to complete 6 of the houses so far - leaving the other "harder" ones for last as I'm manually cutting these with a hobby knife!! May I just say how amazingly well designed your houses are. They are simply gorgeous! I cannot wait to have it all assembled and present them to my friends and family this holiday season. I'm also using string LED lights for my village. They are mesmerizing to look at every night as the village continues to grow. I was wondering whether you had any other designs that may be added to the village? 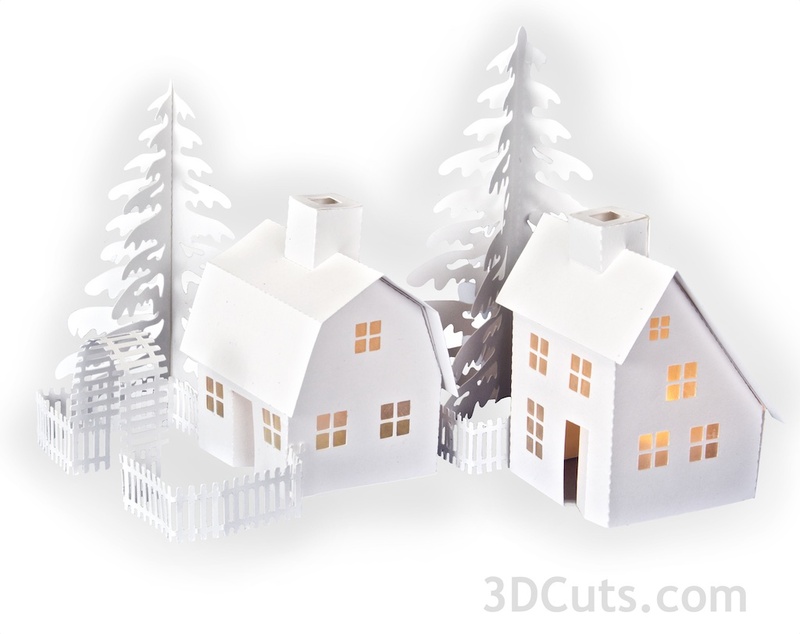 The set I bought at 3DCuts already included your New England Classics. If not, do you plan to add any more in the near future? I'm hoping to make these houses part of my yearly Christmas decorations at home from now on. Adding more designs won't only make it look lovelier, but it would also keep me busy with projects, which I adore. Looking forward to hear from you very soon! Thank you for sharing your designs!!! How lovely to see your work put into action. Such a lovely display.